Today's hula girl in a ti-leaf skirt, as captured in Woody Brown's sequences in SURFING FOR LIFE, is as Hawaiian as poi. Contemporary hula is a medium of entertainment, with lovely hula hands and swaying hips telling a romantic story. In ancient times, hula was a sacred art, danced for the gods who aided mankind. The authentic native Hawaiian dance form has had a curious history over the past 180 years. At one time, there were some 300 distinct hulas in the Hawaiian repertoire. When Westerners arrived in Hawai'i, the hula was Hawai'i's living theater, danced as an accompaniment to an oral tradition of poetry. In 1819, the Hawaiians struck the first blow against hula when they destroyed their own temples, generally considered a consequence of contact with Westerners. Then the missionaries came and decreed the hula lewd and offensive to their puritan ethics. Once their authority was established, the missionaries made strenuous efforts to abolish this aspect of ancient Hawaiian culture. Though it never became extinct, the hula faded from public sight during the middle decades of the 19th century, performed only surreptitiously among the rural people. 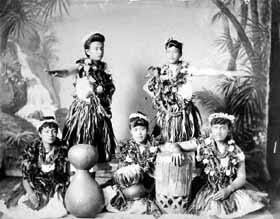 Hawaiian kings encouraged the revival of the hula despite missionary objections. King Kamehameha III attempted to revive hula about 1840, recognizing, along with other successive kings, that the extinction of the hula would mean the end of an important cultural aspect of the severely battered Hawaiian civilization. Hawaiians were already demoralized by the devastation that Western culture had wreaked on their way of life. However, it was not until the reign of King David Kalakaua ( "The Merry Monarch," 1874 to 1891) that hula was effectively revived as an art. During his reign, professional hula troupes became popular again, entertaining people at luaus, public occasions and the theater. Hula began as an ancient Polynesian action dance with bodily movements following the song or chant. Hula teachers were sacred masters inspired by the gods. Pele, the Fire Goddess, inspired her followers with hula chants that are still remembered and performed today. The supreme patroness of hula was Hi'iaka, to whom many cycles of storytelling were dedicated. Sacred hula was often dedicated to Laka, the goddess of the hula. The modern instruments are old forms: the drum; split bamboo sticks; gourd rattles with feather ornaments; castanet pebbles and hardwood sticks. Beside the solemn sacred hula, there always existed a more "profane" form, to entertain and gladden the hearts of both the ali'i (royal) class and the common people. 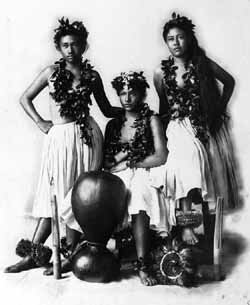 Most of today's dances are descended from this popular type of hula. Both men and women performed the sacred hula in ancient times, though seldom at the same time. The men's hulas were vigorous and forceful while those of the women were more sensual and esthetic. Drawings made by the early explorers show hula dancers as energetic and manly exponents of the dance. The sacred hulas were delicate, artistic and subtle forms of dance, mastered only after long years of apprenticeship under a master teacher. Today, a rare few masters of this ancient art form carry on the tradition. For a time, the lovely hulas of Hawai'i were in danger of disappearing forever. Thanks to the foresight and wisdom of Hawai'i's kings, Hawai'i's unique and graceful national dances are today more popular than ever. The revival of hula is an integral part of the Hawaiian cultural renaissance that has occurred over the last 30 years. Recently, halaus, or hula schools, have been springing up throughout the Mainland and in several countries. In hula, the dancers become one with everything in nature. They bent, swayed and gestured, moving in countless ways to tell countless stories, most of which had deep meanings. Behind these graceful, expressive, sometimes dignified and sometimes earthy dances, lay years of study, meditation and prayer. Its your spirit, its your soul. Its unlike anybody else. This bubbling up in your heart is your personal expression, your original way of saying things. It comes from a place of love and kindness� They'll be no obstacle if you keep your love. That's the answer.